Stay connected in style with the Huawei Watch Smartwatch in rose gold-plated stainless steel with a white leather band. This wrist-worn device connects to your Android or iOS smartphone or tablet to give you convenient up-to-the minute notifications, messaging functionality, and more, all while tracking your physical activity and heart rate. 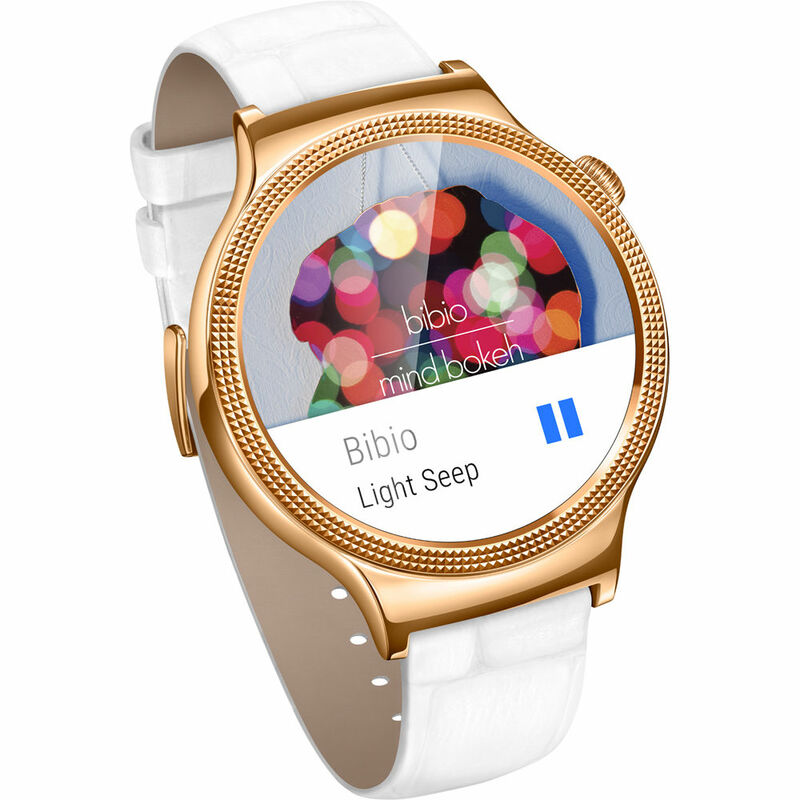 The 44mm Watch features a 1.4" circular always-on 400 x 400 AMOLED display covered by scratch-resistant sapphire crystal and is powered a 1.2 GHz Snapdragon 400 processor and 512 MB of RAM. 4GB of onboard memory lets you store music, apps, and more. It runs the Android Wear operating system, which connects to Android and iOS mobile devices via Bluetooth 4.1 LE (Smart) or to Wi-Fi networks. The Watch features a completely circular 44mm face reminiscent of traditional Swiss watches. Its only button is situated at 2 o'clock for comfort and easy access. The 18mm lug size allows the Watch to accept a wide variety of watch bands. Box Dimensions (LxWxH) 5.2 x 5.1 x 4.7"
Watch Elegant Women's 44mm Smartwatch (Rose Gold Stainless Steel, White Italian Leather Band) is rated 1.5 out of 5 by 2. Rated 1 out of 5 by Diabetic from Huawei Rose Gold Watch When i recieved the watch in the mail, the original box the watch comes in was dented in on two sides, one side being smashed. That scared me so upon further investigating it, the band was wrapped so tightly around the cushion that holes the watch in place in the box, that the White elegant band was completely destroyed in multiple places, being tarnished and not white in any places the rubbing occurred. Rated 2 out of 5 by Anonymous from Wristband The wristband was tarnished. What causes the big price difference between this and the blue leather jewel version? They seem otherwise the same. The blue jewel version you are referring to is also encircled with Swarovski crystals. The aesthetics is the only difference. Is this one 44mm or only 42mm? From the Huawei website it looks like this one without the crystals is 42mm.